You are currently browsing the category archive for the ‘about me’ category. So cozy in her pajamas, the little princess didn’t want to change out of them. 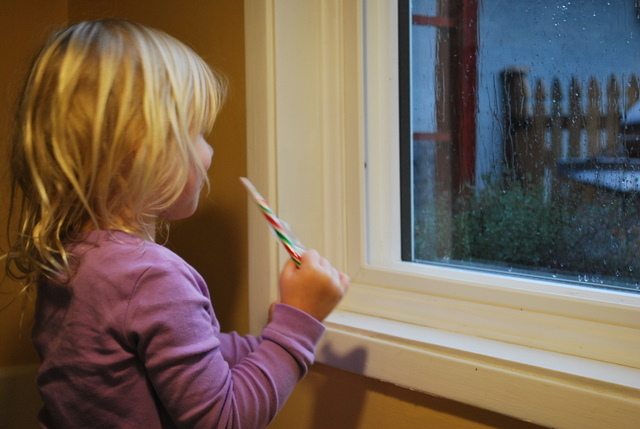 So she has Snowman pants and a snowman top on, eating a candy cane staring out the window at the rain. Then I introduced her to an ipad drawing app where she happily played for an hour laughing so hard that I was a little concerned she was going to pee on my lap from laughter. For my sister in her own fairy tale with her very own Prince Charming. 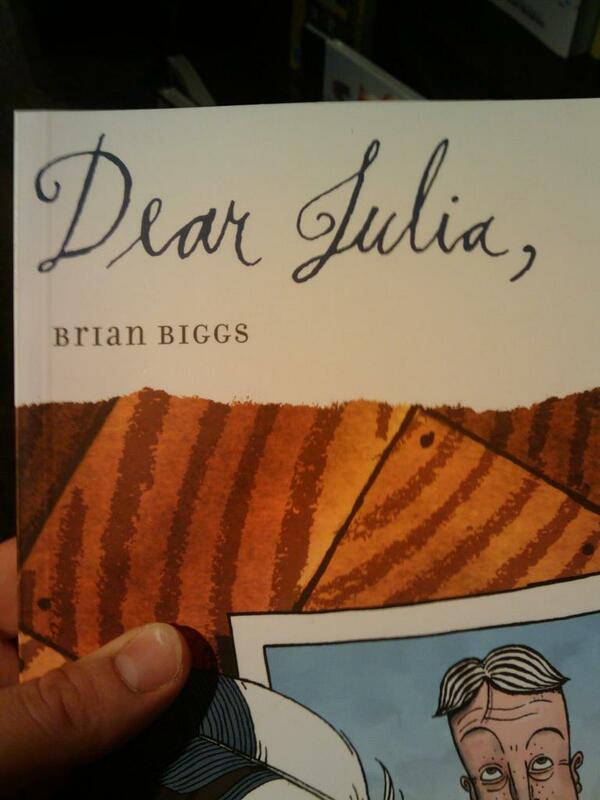 Her name, not surprisingly is Julia, and her prince is Brian. Which makes this book/comic perfect. And I love the art and the font. It was a great rainy Sunday find. I mean, look at that man’s eyebrows! 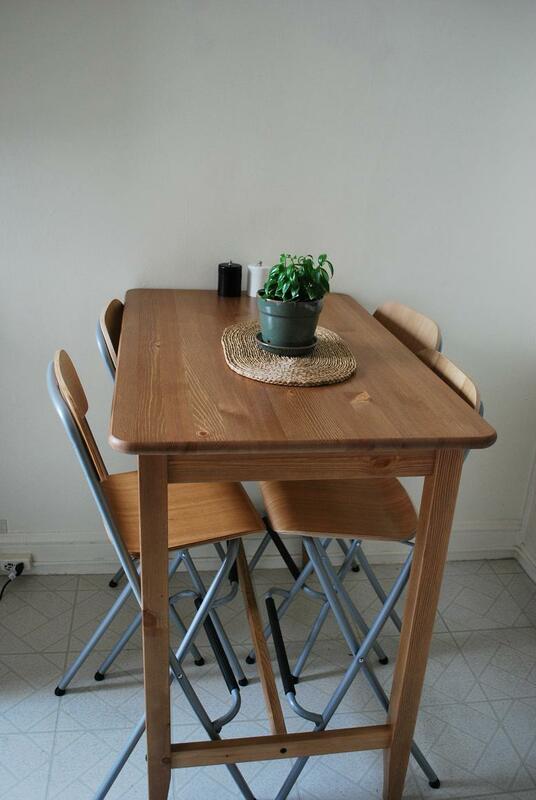 We went to the fairy tale land of Ikea the other day to pick up some shelves and a new kitchen table. The other one we had was one we got at a garage sale down the street and was way too big for our kitchen. The new one is solid wood and bar height. It fits perfectly and I love it. On my table usually lives a plant or some flowers, the salt and pepper grinders and frequently the butter dish. What are constants on your tables? This weekend is the start of fleet week here in the San Francisco. It’s also Thanksgiving weekend back in Canada. I will be making pumpkin pie and watching bits of the air show. Today, the Blue Angels (like our Snow Birds) are doing circle loops of the city to say hello. They’ll be practicing tomorrow, then Saturday is the big show. I’m hoping to catch bits of it from home like I’m doing today. I keep trying to snap a picture of them flying by, but so far I haven’t been fast enough. Some of you may know, I’ve been trying to get myself an ITIN. It’s like a social security number, except it means I can’t work, but still have to pay taxes. I want one because it means I can open a savings account. But when I went to the IRS today (after finally getting my paperwork together), they say that I *still* can’t get one until I file my taxes. Ridiculous. I don’t even know if I will be able to file taxes because I CAN’T OPEN A SAVINGS ACCOUNT WITHOUT THE STUPID NUMBER! It’s a ridiculous catch 22 that pisses me off to no end. Why won’t you let me earn some interest on my money so that I can pay you taxes? I didn’t think this would be so hard. Photo booths are always a lot of fun, but I frequently run out of ideas after the first or second picture. I’ll never be a model. PS: I got a new haircut! I looked great after the stylist finished with it, and now I’ve washed it and it’s half curly again. San Francisco fog makes everybody’s hair weird. Living here has made me more conscious of design. I don’t know if it’s because I have more time on my hands to read design blogs, or if it’s just the availability of nice things here. Either way, I’m gradually making our little home more put together. When we first moved in, we picked up a bunch of furniture from garage sales and Craigslist. We’re not super happy with it all, but it’s doing the job. I think we will eventually replace most of it, but for now, we keep moving things around trying to get the best fit. The front hall has a lovely little hole in the wall that we were originally keeping our keys and pocket contents (as Prince Charming calls them). It was messy and not the most beautiful thing to see when you came in the door. Then this cute little owl arrived from England. And I made a little bird to go along with it and perch on top of the mirror. I have a vision of eventually finding a typewriter and putting it on this table (which used to be in the living room, but makes a great entry table) so I can write Prince Charming messages and he can write them to me too. But as the ones I have found so far are over $100, I just have flowers for now. The picture above the owl is a copy of our wedding invitation. Designed by Yours Truly. It’s our silhouettes. I love it. 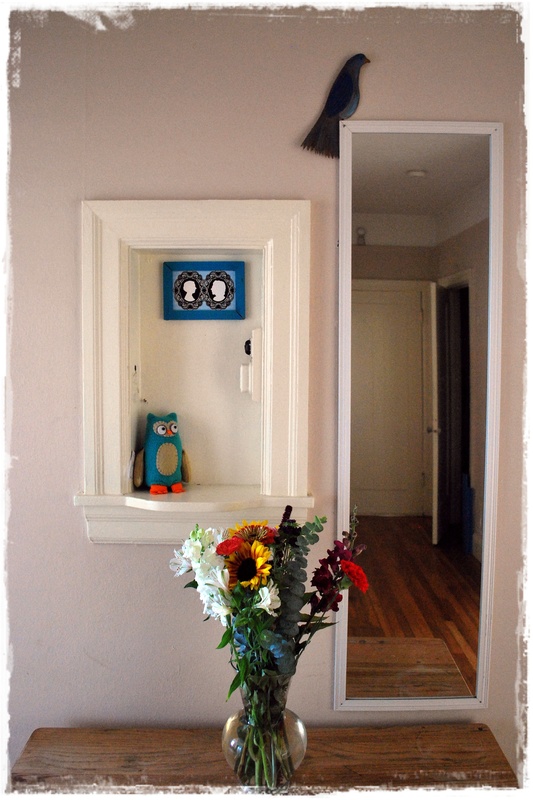 Here’s hoping that the rest of the house comes together as well as the front hallway has! Once upon a time, there was a blog called Learning to Garden. The girl who wrote her stories there and posted her pictures liked the outdoors. She lived with her Prince Charming in the basement of their house and had a lovely back yard. There were a lot of things she didn’t know and a lot of things she was willing to try. Then she moved to San Francisco. Away from what she knew, to an apartment with a back yard garden in which she had a tiny place to plant things and encourage them to grow. The weather was different, the seasons had different lengths. The girl had no idea how to make things grow well here. Eventually, the girl made friends. One friend said to her “You’re just like Snow White. I bet the birds even come and dress you in the morning!” People were amazed at the things the girl was willing to do herself. It wasn’t just gardening anymore. It was cooking and making things and going places and trying so many new things that were here in this city that is so much bigger than the old little neighbourhood. A change was needed. The girl needed to stop writing stories only about gardening. In the back of her head, she said: Learning to Garden isn’t the only thing I’m learning to do! Time for a new name! And so here we are. A fresh start. Welcome to Fairy Tales of the City.